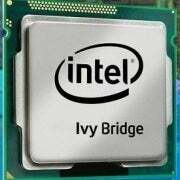 Intel announced Thursday that its entry-level Ivy Bridge Core i3 processors will be available after June 24--much earlier than the third-quarter timing previously expected. Intel’s Taiwan branch announced these chips will start shipping as early as the third week of this month, according to a VR-Zone report. Previously, the dual-core Core i3 chips were expected to launch just in time for the holiday season. Once Intel releases its Core i3 chips, we should soon see even more affordable laptops and desktops. Higher-end versions of Intel’s third-generation processor were released earlier this year--the top-of-the-line Core i7 and mainstream Core i5 processors. These are already showing up in new and updated laptops and desktop PCs. The Core i3 chips will all most likely be dual-core processors, since they’re the entry-level versions. At least two Core i3 models will be available, according to CPU World: The ultra-low voltage i3-3217U (most recently announced as an option for the Lenovo IdeaPad U310 and U410 Ultrabooks) and the i3-3110M running at 2.4 GHz (comparable to the faster Sandy Bridge-based Core i3 processor available today). This means that, by the time back-to-school shopping begins, we should have our pick of budget Ivy Bridge laptops and desktops in addition to the higher-end models rolling out now.